What do you look for in a wall calendar? Readable dates, yes. But how about a quotation to stir the soul? How about a photograph to lift the spirit? The Benetvision wall calendar contains monthly quotes by Joan Chittister and full-color photographs. For 2014 calendar, Click here. Inspiring meditations on the Way of the Cross for everyone’s life journey. 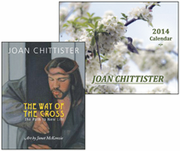 When popular writer Joan Chittister heard that artist Janet McKenzie painted the fifteen stations of the cross, she was eager to write the accompanying text for her first book-length treatment of the stations. McKenzie’s eye for the sacred and Chittister’s profound meditations on the mysteries of the Cross are joined in this deeply reflective and inspiring book. These meditations are appropriate for Lent and throughout the rest of the year. Orbis • hardcover • Full-color illustrations • 112 pages • Reg. $25. For Way of the Cross, Click here.